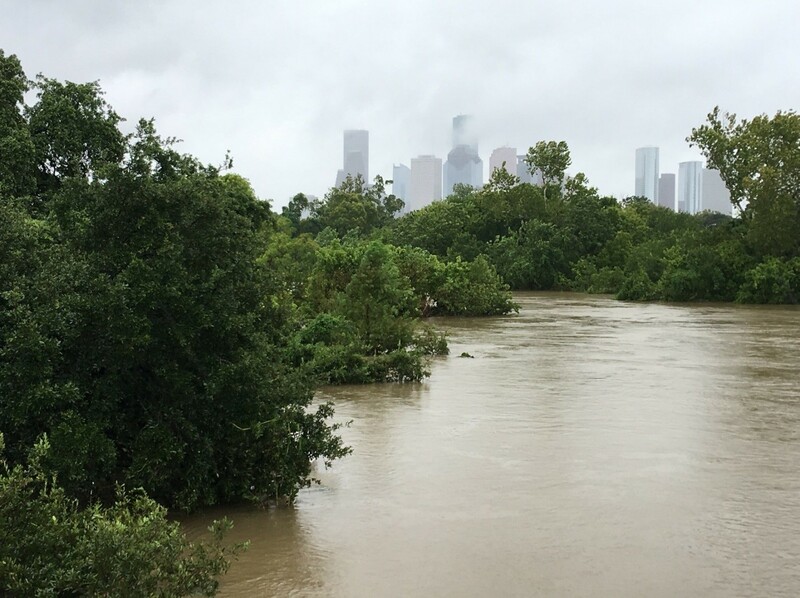 By Tim McSweeny and Dan Brooks, Ph.D.
Last year Houston was devastated by Hurricane Harvey, with flooding covering streets, bayous and communities throughout Houston after the storm deposited about three feet of rain. One of the many parts of the city affected by the storm was the colony of Free-tailed bats living under the Waugh Bridge. We have been making observations of the colony and monitoring bat activity, and some behavioral changes have been noticed. 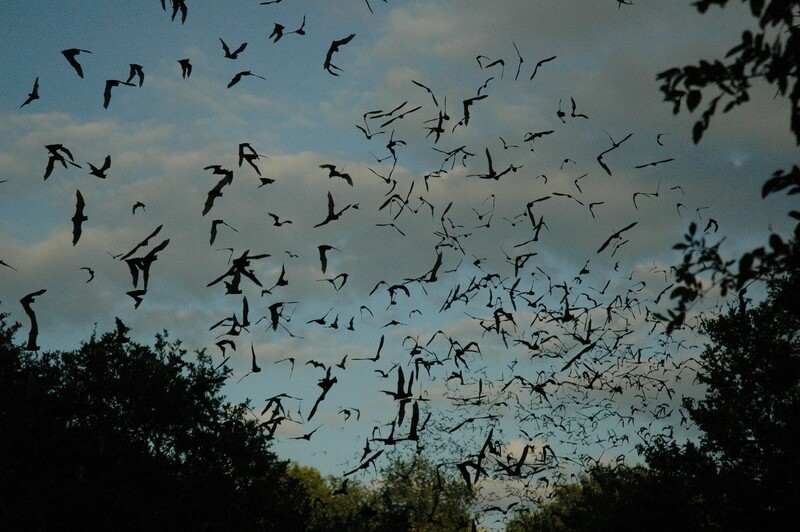 Before the flood, there was an estimated quarter of a million bats living under the Waugh bridge, making it one of the larger Mexican Free-tailed colonies in the state. During the flood, bats flew to nearby buildings for shelter, such as the Bank of America building, and could also be seen flying out during the day to escape the high waters. There were also reports of large numbers of bat carcasses seen floating in the water. After the waters receded, more bat remains were found stuck to the sidewalk under the bridge. Hopefully we will be able to get an idea of the colony size in the near future, as the bats returned to the bridge after the water level had gone down. There are two noticeable changes in behavior that have been observed since Hurricane Harvey. 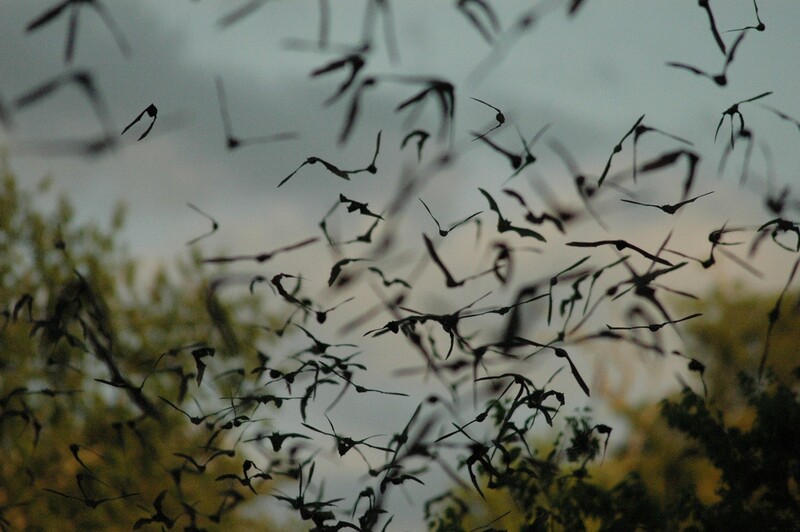 The bats are now flying out in smaller groups or as individuals rather than a single or several large swarms. Recently there have been gaps between the larger groups as they emerge, ranging between a few seconds to several minutes. This has had the added effect of altering the amount of time that it takes for the bats to emerge, ranging from a few minutes to nearly an hour. The second major change in behavior has been the time of day when the colony begins to fly out. Before the flood the bats would usually fly out around dusk, yet even approximately five months after Harvey most of the colony exits the bridge after dark. We are continuing to monitor the Waugh bridge colony to see if there are any other changes. It is possible that the reduction in population size is simply being driven by the bats annual migration to warmer climates for the winter. This is currently being tested by examining their DNA to determine which subspecies (or hybrid) of Free-tailed bat is present, as one subspecies migrates during winter and the other does not. The bats are a beautiful part of our urban ecosystem, and we encourage the public to visit the colony to watch the spectacular emergence! As curator of vertebrate zoology, Dr. Brooks has more backbone(s) than anyone at the Museum! He is recognized internationally as the authority on Cracids - the most threatened family of birds in the Americas. With an active research program studying birds and mammals of Texas and the tropics, Brooks advises several grad students internationally. At HMNS, Brooks served as project manager of the world-renowned Frensley-Graham Hall of African Wildlife, overseeing building by an incredibly diverse array of talent by some 50 individuals. He has also created and/or served as curator for various traveling exhibits, including "Cracids: on Wings of Peril". We have bat neighbors at my miniplex apartment in Montrose. I don’t think that the neighbors are fond of them, though. They tend to “sing” deep into the night in an eclectic chorus of high pitched whistles and thrums. I like the bats, but I understand how smelly and loud they can be when nestled in the eaves of an older building (my particular unit isn’t affected). Would a bat box help the bats relocate on our property? I don’t want them to move away because they are very helpful with the mosquitos in our neighborhood, I think. Previous Post How The Core Controls Us All. The Earth's Core, That is. Stay Warm And Merry At HMNS Events This Week!